This document will assist users in the setup and management of running multiple DWX-50's with SUM3D CAM software. This latest Firmware for the DWX-50 will offer users Windows 8 support and should be used with the latest vPanel 2.2 and Drivers available. *****After upgrading to this version, you need to perform [Correct Rotary Axis] on VPanel. This document will assist DWX-50 users to properly maintain and tighten the collet monthly or every 200 hours of operation. Spanish Version - This document will assist DWX-50 users to properly maintain tightning the collet monthly or every 200 hours of use. This DWX-50 supplemental maintenance guide has important information for the periodic maintenance that should be completed prior to milling and after milling is completed. 2 Page specification sheet on the DentalPro Base unit. This document will walk DWX-50 users through the steps to properly install the latest version of firmware. 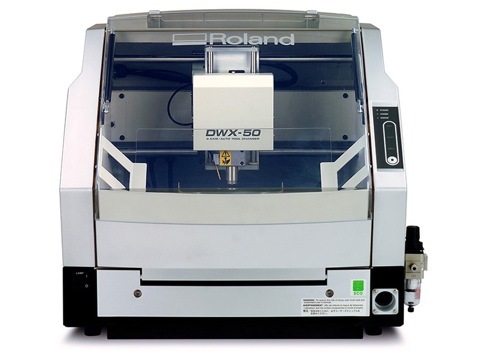 The DWX-50 Setup & Maintenance Guide will assist users in initial setup of the machine along with periodic maintenance procedures to assist with regular and daily upkeep. vPanel V2.2 for the DWX-50 includes tool management, email notification to include free email services (Gmail, Hotmail, etc.) and supports WIN8. Must use Firmware V2.2 and above**** [Correct Rotary Axis] must be completed after update. Training video on how to clean and maintain your DWX-50 for regular use and calibration. ​My DWX-50 has a fair amount of cutting dust on the X and Z shafts. What steps should I take to clean them?